NCCPR Child Welfare Blog: UPDATE: Confronted with the horrors at his shelter, NYC child welfare chief acts immediately – to pass the buck. UPDATE: Confronted with the horrors at his shelter, NYC child welfare chief acts immediately – to pass the buck. But a judge finds that, in one particularly egregious case, the city's Administration for Children's Services couldn’t even get the buck-passing right. In New York State, individual counties and New York City run child welfare, but services for the mentally ill and the developmentally disabled are provided by state agencies. Hansell blamed the state. Since some of the problems involve older youth with mental health and developmental disability issues his response to the chaos at the center boiled down to: Hey, not my job! There is actually a lawsuit over this. Perhaps in the end it will turn out the state really does share responsibility (though it’s important to note that many of the longstanding problems at the de Blasio / Hansell Center involve children and youth for whom Hansell’s agency has unambiguous responsibility). ● As long as the youth are in your custody you do not allow children, youth and young adults to be jammed together in an overcrowded shelter. ● As long as they are in your custody, you don’t allow them to bully and terrorize each other. ● And as long as they’re in your custody you do not allow a youth who suffered brain and spinal injuries to be stuck there for a year, with no therapy, without even a working wheelchair, sometimes left sitting in his own urine. 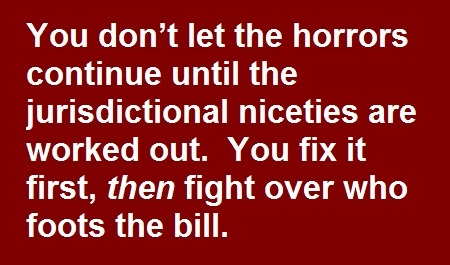 You don’t let the horrors continue until the jurisdictional niceties are worked out. 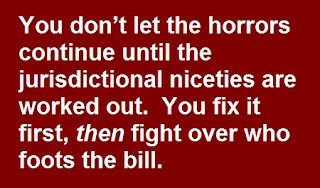 You fix it first, then fight over who foots the bill. The case of the brain-injured youth was so bad that a judge ultimately held Hansell in contempt. She found that ACS couldn’t even get the buck-passing right: Hansell’s agency repeatedly missed deadlines for submitting applications to the relevant state agency. Is ACS angling to open more group home / institution beds? But it gets worse. Hansell also blames the problems at the center in part on the closing of some beds in group homes and institutions – which suggests he might want to reopen some of them. But the reason they were closed in the first place is that they’re so bad for children, and because many of them were at the center of scandal after scandal over abuse and exploitation – (here’s a case in point) – just like the Bill de Blasio / David Hansell Children’s Center. So let’s recall, again, the history of the shelter. An earlier shelter had been shut down as a hellhole in 1977. But when the new one opened, in 2001, Nicholas Scoppetta, the ACS commissioner at the time, promised that this time it would be different. Of course it wasn’t. So consider: The old shelter became a hellhole and was shut down. Then a new shelter is opened amid promises that this time it will be different. 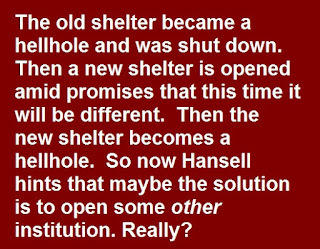 Then the new shelter becomes a hellhole. So now Hansell hints that maybe the solution is to open some other institution. Really? If he’s allowed to get away with it, I’m sure he’ll be at the dedication ceremony, explaining why this institution will be different.